We’ve got six days left until hubby returns from a six-month long deployment. You might think that 6 months is a long time. I suppose it is but I choose to look at it another way – as two 3 month deployments with a 2 week break in between. This deployment seemed to go by quite quickly compared to the others. I think it helped that both kids were in school full-time and had several extra-curricular activities. It also helped that I was doing volunteer work as well as running my own business. Keeping busy certainly makes the time fly by. Of course the last month or so of the deployment has been all about the move so I haven’t really had a chance to think about too much else. Many new wives/girlfriends ask me how to cope during a deployment (since this has been my 5th extended deployment). Learn something new. Taking a course about quilting or computing or anything you find interesting. Volunteer in the community. Get a job. Even a part-time job will get you out of the house meeting new people. If you already have a job, make sure you don’t immerse yourself in your job. Find time for some fun too. Make friends. Hang out with people whose company you enjoy. Make play dates for your kids and get to know some other parents. Get help. Don’t think you can do it all, you can’t. If you need help house cleaning, get help. Ask a friend or family member. Non-military folk often want to help but they don’t know what they can do for you or how to ask. If someone has offered to do something, take them up on it (just don’t abuse their kindness). Military folk know all about deployments and if they can’t do something for you they often know the services you can contact to get stuff done. 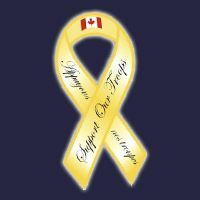 Don’t hesitate to call your local Military Family Resource Centre. They have tons of resources designed just to help you cope with a deployment. Communicate. Write a daily email to your deployed partner recounting the day’s activities. It helps them stay in touch with the “real world”. I always remember that my Grandmother only received one or two airmail letter per month while my Grandfather served in WWII so we are quite privileged having email today. Steer clear of the “drainers” and complainers. You’ll meet partners of other military members who whine and complain about the deployment. You will also encounter friends and family members that don’t understand why you would stay in a relationship with someone who would “leave” you for such a long time. They will only make you feel bad and doubt the relationship that YOU have with YOUR partner. Stay away from these people. Have you and your partner ever spent a long period of time apart? Add your tips on how you cope! I actually enjoy the break.. It is kind of refreshing to be alone for a little while and not have to pass all decisions on to your other half for their input (not like we really listen, just make them feel like we do)… But, you are right, you need to take up a hobby, craft, etc.. I once redid my entire photo albums into scrapbooks. It certainly helps pass the evenings.. Volunteering is also great.. I do scouts with my boys to help pass the time. The most important is NOT to stay at home.. get out, have fun! It can be enjoyable.. And, when he (or she in the case of my hubby when I have been away 4 times) comes back, you can rekindle like newlyweds.. It really does help the relationship.. You discover how good you do have it! @Telah = the rekindling like newlyweds IS one of the best parts isn’t it!